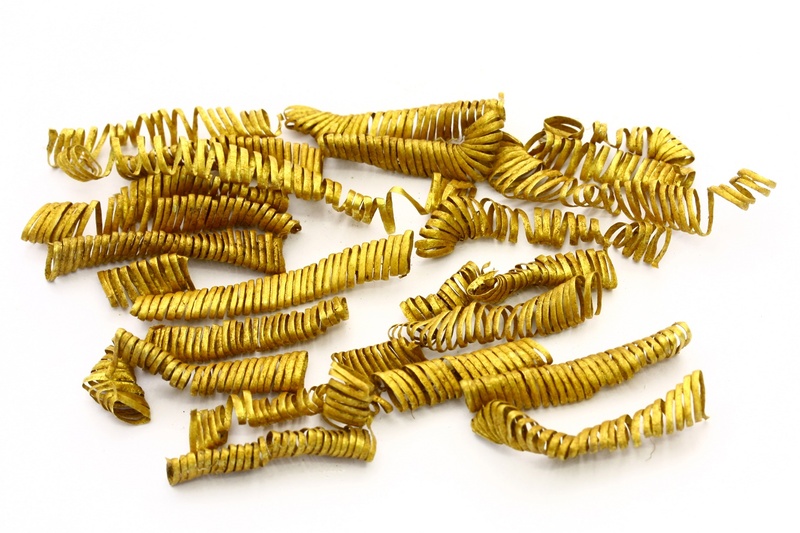 Nearly 2,000 small gold spirals from the Bronze Age have come to light at Boeslunde on Zealand, Denmark. Archaeologists have never seen anything like it before. They do not know what they’ve been used for, and they have never seen them before in Denmark. The archaeologists at the Museum Zealand and the National Museum of Denmark are facing a little mystery, when they consider what they have just excavated. Close to 2000 gold spirals of up to three centimeters in length and fragments of gold spirals. They are made of very thin, flattened gold wire and date to the Bronze Age in the period 900-700 BC, explains curator at the National Museum of Denmark, Flemming Kaul. – Maybe the spirals have been attached to cords which have served as a small fringe on a hat or a parasol. Perhaps they have been braided into the hair or been embroidered on the suit. The fact is that we do not know, but I tend to believe they were part of a priest king’s costume or headwear, says Flemming Kaul about the strange spirals. He has unearthed the gold spirals at Boeslunde on Zealand along with Kirsten Christensen, who is curator at Museum Vestsjælland. – A couple of years ago, two local amateur archaeologists made a great discovery. They found four heavy gold arm rings, so-called oath rings. This magnificent find prompted us to carry out an excavation proper, in order to find out whether there should be more prehistoric gold hidden in the field, says Kirsten Christensen. Twice, excavations have taken place at the site. 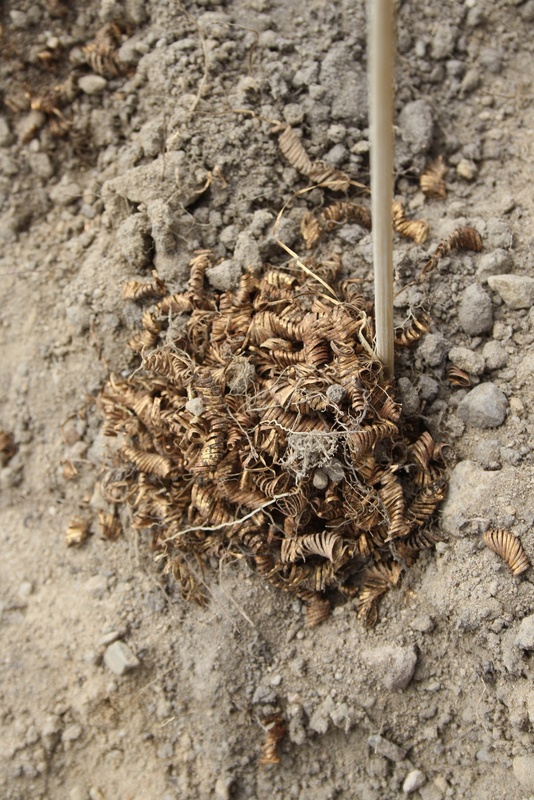 At first, the archaeologists from Museum Vestsjælland just found a few spirals. One of the finders of gold rings brought one of them to a jeweller, who could establish that it was made of gold, not brass. Therefore the archaeologists put the shovel in the ground again along with archaeologists from the National Museum of Denmark. And this time they found the many gold spirals, which together weigh between 200 and 300 grams. Additionally, they found two gilded dress pins, which make the find possible to date quite precisely. The gold spirals were excavated in a field in an area of just a few square meters. It was possible to isolate two main concentrations. In one, they lay in rows or in small bundles of three and four pieces together. In the other, which is of particular interest, the spirals were collected in a pile. – The gold spirals were assembled in one big lump, and under them we found black flakes of something that resembles pitch, which was part of the wooden box that contained the spirals, says Kirsten Christensen. Studies at the National Museum of Denmark could confirm that the material is in fact pitch, probably of birch. The pitch flakes have clear imprints of the wooden box’s surface on one side and imprint of skin on the other. Evidence suggests that the pitch has been used to hold a leather lining on the inside of a wooden box with a bark lid; a form of dress chest or hat box to a fine gold embellished dress or headgear. The archaeologists are not surprised that the many gold spirals should appear at Boeslunde. The area has some of the largest gold finds from the Bronze Age of Northern Europe. Kirsten Christensen says that besides the four gold rings that triggered the excavation, six other large and heavy gold rings have been found in the same area. And in the 1800s some local farmers found six gold vessels at Borgbjerg Banke, located some 500 meters away. – The rings weigh together 3.5 kg, and the bowls and beakers more than a kilogram, so it is one of the largest gold finds from the Bronze Age in Northern Europe. It shows that the place had a special significance for the Bronze Age people when they chose to sacrifice several kilos of gold, says Kirsten Christensen. Flemming Kaul is convinced that Boeslunde was a special sacred place in the Bronze Age where prehistoric people performed their rituals and offered gold to the higher powers. The big heavy oath rings of gold, which can weigh more than half a kilo, are always found in sacrificial contexts. Therefore, they had a very special status, says Flemming Kaul. He imagines that gold spirals and the oath rings belonged to a kind of priest-king. – Maybe the priest-king wore a gold ring on his wrist, and gold spirals on his cloak and his hat, where they during ritual sun ceremonies shone like the sun. The sun was one of the most sacred symbols in the Bronze Age and gold had a special magic. The gold itself embodies the sun. Gold has the color of the sun, it is shining like the sun, and it is indestructible, immortal and eternal. Therefore they sacrificed the priest king’s riches to the sun or hid them away in a wooden box between the ceremonies, suggests Flemming Kaul. Archaeologists at the National Museum of Denmark and Museum Vestsjælland are convinced that there is more gold to be found at Boeslunde. Therefore Museum Vestsjælland will continue the search with the region’s amateur archaeologists, and they expect that the metal detectors will find more gold. Although the gold spirals were found during archaeological excavations, the National Museum of Denmark will still pay the so-called danefæ (treasure trove) compensation.